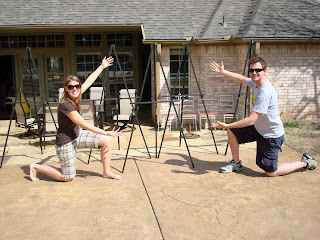 This weekend Chris and I tried our hands at some painting, gluing, assembling and stamping. We've yet to do anything by hand for this wedding and we figured, how hard can it be? 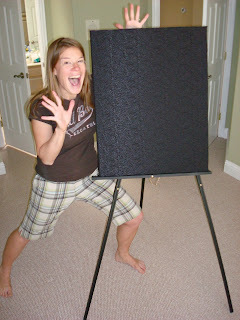 The first project was fabric boards for photos during the cocktail hour. 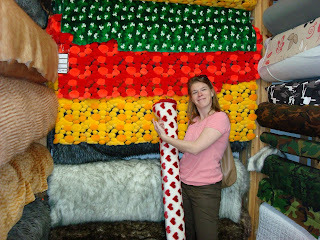 My mom and I started by scouting out fabric at a store down on Harry Hines. With so many great fabrics, it was hard to choose. 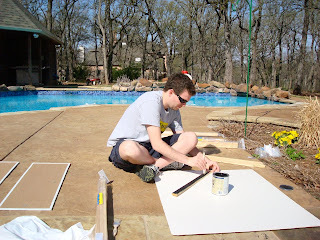 Then it was on to gluing the fabric to the boards - seemingly an easy task, but alas, canvasing ain't easy. 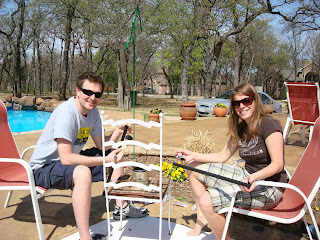 Then we moved on to painting and assembling easels for the boards to rest on. And then, just when most normal people would take a break, we started stamping things. It's really a good thing we've contracted out the rest of the wedding details to professionals.